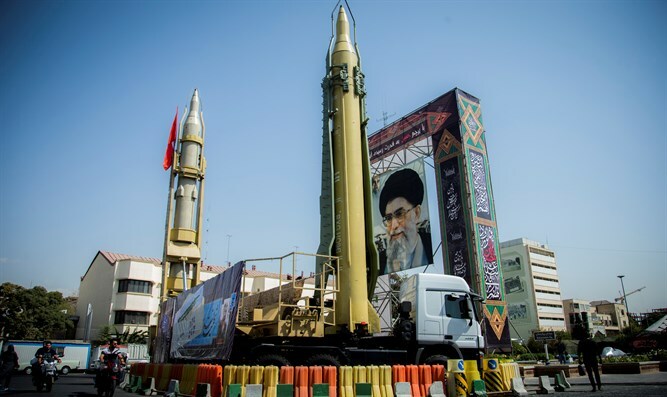 Is Iran preventing an Israel-Hamas agreement and is it behind current escalation? On Tuesday Israeli Defense Minister Avigdor Liberman said Syria was building an even larger army it had before the civil war started in 2011. “We see the Syrian army, which is not satisfied with taking control of all the Syrian territory, but is clearly building a new, large-scale land army that will return to its previous dimensions and beyond,” according to Liberman who spoke to reporters during a massive drill by the Israeli army on the Golan Heights. Israel was following all the developments in Syria and was ready for every scenario, the Israeli DM added. Liberman didn’t address the growing Iranian threat from Syria, but he no doubt knows what’s happening on the other side of the border with Syria where the Iranian-Russian backed pro-Assad coalition seized the last pockets of Islamist resistance at the end of July. Iran is tightening the noose around Israel – not only in Syria where the Mossad reportedly killed the country’s most important missile scientist last Saturday – but also via its odd proxy Hamas, the Sunni Islamist terror organization that rules Gaza. To understand what’s going on in southern Syria on the other side of the border with Israel, one should read a research paper by the Institute for National Security Studies written by Orit Perlov, a social media analyst who focuses on Syria. To help Assad regain control over territories he lost during the first phase of the now seven-year-old Syrian war, Iran established the Syrian National Defense Forces (NDF), which today has 90,000 fighters, most of them Shiites and Alawites. The NDF is the equivalent of the Iraqi Hashd al-Shaabi umbrella organization of predominantly Shiite militias, established under the supervision of Qassem Soleimani, the shrewd commander of the Quds Force of the Iranian Revolutionary Guards Corps which has up to 5,000 soldiers in Syria. Iran was also responsible for bringing Afghan and Pakistani Shiite militias into the Syrian fray. The Afghan Fatemiyoun Liwa militia and the Pakistani Zeinabiyoun Brigade, which have up to 15.000 fighters in Syria were used by the Quds Froce of the IRGC as a striking force in the first phase of battles against rebels and later for strengthening the Alawite and Shiite community in Syria, according to Perlov. Iran’s Quds Force also uses Iraqi and Lebanese Shiite militias in its drive to advance its long term goal of establishing a permanent foothold in Syria and to attack Israel from there in the future. These militias return to their country of origin once their mission is completed, but were a decisive factor in Assad’s come-back. Then there is Hezbollah, the Lebanese terror organization, which has up to 9,000 fighters in Syria and has established a foothold in the so-called Q-zone in Syria, Quneitra, Qalamoun Mountains and Qusayr, where Iran is suspected of having an underground nuclear facility. Iran also uses Shiite Lebanese and Iraqi mercenaries who are not members of the various militias, but help in areas where support is needed. Almost 3,000 members of Shiite militias have died in combat during the last phase of the Syrian war, according to the Arab news outlet Albawaba. Perlov confirmed that during the ‘liberation’ of the Quneitra region, Iran’s Shiite proxies in Syria were wearing Syrian army uniforms to cover up their presence along the Israeli border. The INSS researcher thinks that Israel is currently ignoring the Iranian presence along its border with Syria and prefers focusing on the prevention of “the consolidation of substantial Iranian military capabilities in Syria,” but could attack the Iranian forces when they become a real threat to the country. The revelations about Iran’s military build-up in Syria coincided with an admission by a high-ranking IRGC officer about Iran’s role in the latest escalation in the Gulf of Aden where the Islamist regime in Tehran ordered the Ansar Allah militia to attack two Saudi oil tankers in the Gulf of Aden. Gen. Naser Sha’bani, a top commander of the IRGC, told Fars News in Iran that the IRGC had ordered the Ansar Allah (Houthi) militia to attack the Saudi ships and confirmed that Iran is using its proxies as “homeland depth” which would continue to be used against Iran’s rivals in the region (read Saudi Arabia and Israel). We now turn to Gaza where Hamas just launched its most wide-scale attack on Israel since the 2014 summer war, sending 180 missiles and mortar shells at Israeli towns and communities in the south of the country on Wednesday night. An overlooked aspect of what is called the current ‘flare-up’ is the sudden trip of the deputy head of Hamas’ political bureau, Saleh al-Arouri, to the Gaza Strip. Al-Arouri, who lives in Lebanon, arrived in the Gaza Strip last Thursday, officially to participate in the talks about a ceasefire with Israel and Palestinian unity. The Hamas terrorist was the driving force behind another reconciliation which took place in October 2017. On Friday October 20, 2017 al-Arouri, who headed a large Hamas delegation, arrived in Tehran for talks about reconciliation with Iran. An Iranian official later said that renewed Iranian support for Hamas was conditional for their continuing the fight against Israel. Shortly afterwards, Hamas put an end to the relative quiet that had been in place since the war in 2014 and began preparations for the so-called ‘Great March of Return’ which later turned into what is dubbed ‘the Kite Jihad’. Israel’s internal security service Shin Bet earlier revealed Iran was aiding Hamas in keeping the violence against Israel continuing. Al-Arouri’s sudden trip to Gaza could therefore be another Iranian attempt to prevent Hamas from entering into a five or ten-year long ceasefire with Israel.